My GWS Tiger Moth took a lot longer than the estimated few hours, mainly due to the modifications I made. I honestly do not see how a new builder and flier could put the kit together in a manner that would be very durable. The instructions, particularly regarding wing strut installation, are very poorly done. After the modifications (described in detail at the bottom of this page), the Tiger Moth flew extremely well and would even loop stall and roll using the stock motor and propeller with a 600 mAh NiCad. This is my GWS Tiger Moth, circa 2002. Quite a few modifications were made during the initial building to address what I though were weak points that would cause the aeroplane to wear out before its due time. Described here are the changes that I made. Some of the modifications were from ideas found on other websites, and the rest are home-brews. 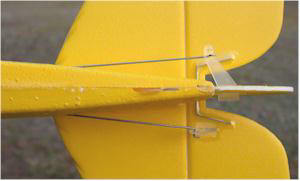 I highly recommend anyone else building one of these Tiger Moths do the same. I made a few modifications from the stock instructions, like reinforcing the wing joints with ProBond polyurethane glue and using epoxy for the landing gear mounts. I also epoxied a wire stiffener to the elevators and super glued strips of 1/6" balsa to the outer wing strut for stiffness. 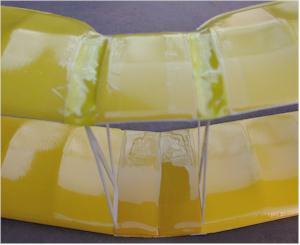 Scrap plastic was glued to the bottom of the lower wing where the rubber bands cross over. Servos are mounted to traditional hardwood rails, and adjustable pushrod ends are used rather than a Z-bend. The flight pack is a GWS CB100/F (Futaba compatible), on channel 58. The receiver range checked (transmitter antenna down) farther than the one that came with my Futaba 3 channel system! 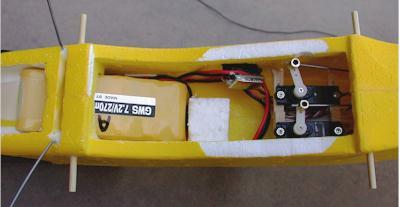 The fuselage front was modified to make room for a 270 mAh NiCad (150 mAh is standard), and a block of foam was glued in to stop the battery pack in the correct position for proper center-of-gravity location. A heat sink is clipped to the motor. Ready-to-fly weight is 9.1 oz. (max recommended is 9.8 oz.). The receiver is mounted with foam in the fuselage cavity behind the rear cockpit. No trim weight was needed to achieve proper CG. No overheating has been noticed. The first flight was ROG (rise off ground) off of asphalt in about 10 feet with no wind. With a full charge, level flight was maintained at about 1/4 throttle. Although great care was taken to rig per the instructions, the Tiger Moth tended to nose up as power was applied, causing the need feed in down elevator. To cure the problem, the hardwood motor stick was cut through most of the way at the firewall, and bent down by about 4 degrees, then the slit and surrounding area was filled with epoxy. The result - no elevator trim change needed with power changes. Stalls recover in about 10 feet vertically. 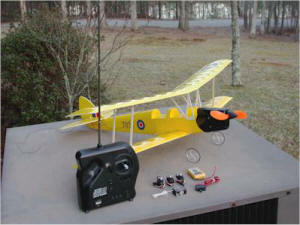 The Tiger Moth flies very nicely, and I can perform circles and figure-8s at eye level in an area about 100 feet square. Landings are a breeze, and it has not yet nosed over on a landing. Hand launches are a non-event, and the plane glides power-off surprisingly well. On a full charge, I consistently get 12 minute flights - not bad for an e-plane! Anyone with a couple dozen solo flights under his belt should be able to handle the Tiger Moth with no problem, but I would not recommend it to a first-time flyer. My TM has never been crashed, so I don't know how well it bounces, but online reviews claim it survives reasonable abuse rather well. Although there is nothing but praise online for the Tiger Moth, my only caution is that the parts fits are not exactly laser quality, and the proper rigging of the two wings and elevator are not detailed. To the inexperienced builder, misalignment of the two wings with respect to each other would likely occur, since there are no fool-proof keying points. The rather flimsy unmodified outer wing struts would likely make flight squirrelly since the wings would be able to change orientation as flight loads vary. Oh, one other serious suggestion would be to just discard the glue that is supplied with the kit. Every online review recommends against using the glue, and it is easy to see why.